Nose: cooked ham, sulfurized raisins, a bit musty cellar, gingerbread, heavy dark fruity sherry, ginger and subtle oak. With water it changes a lot. Now the fruity notes of the sherry and the oak are a little more effective. Taste: a lot of umami and gunpowder, prune, sulfur, freshly tanned leather, the alcohol is well integrated - but tempts the aromas neat power. In the finish then next to the sulfur (with aromas of old eggs) a lot of sherry sweetness, citric acid and musty oak. Here as well, as in the nose, water helps to create a more fruity and gentler experience without losing the good flavor depth. Super Glenrothes desperately needs water. So you get a wonderful combination of dark fruity sherry and musty sulfur notes. Exactly my thing but if you can start with umami and sulfur in the whisky little you should have no joy with the dram. A terrific sherry hammer. Perfect for the end of a successful whisky evening! Extremely strong in the start, very strong impressions of raw ham, grilled or almost black beefsteak, dried berries, sulfur, subtle smoky or the smell of a sticky pub at the end of an evening; Wooden floor, dusty furniture; The sulfur is not to be forgotten! Here, of course, sherry, the typical dirty, musty notes of Glenrothes and then even more wood than the WID: 93723. He is also pretty good. But it gets better with water. Compared to the SV here is more tension and complexity, through the stronger wood influence, in there. I like it. Really more complex and interesting with water, otherwise it could be any distillery as everything is put on the barrel but it is devilishly good. Caramel and nutella! Gourmand, everything on the barrel, a liquid candy! With water, blackberry jam and strawberries. Sweet but spicy, a little sulfur but it dissipates with a little water. Spices (clove, among others). Slightly tannic. With a little water, become bright! I found this to be a rather typical Glenrothes to be honest. Earthy and rich, with a flinty edge that adds depth. My only gripe is the lack of sweetness on the palate, but that is a rather subjective thing. 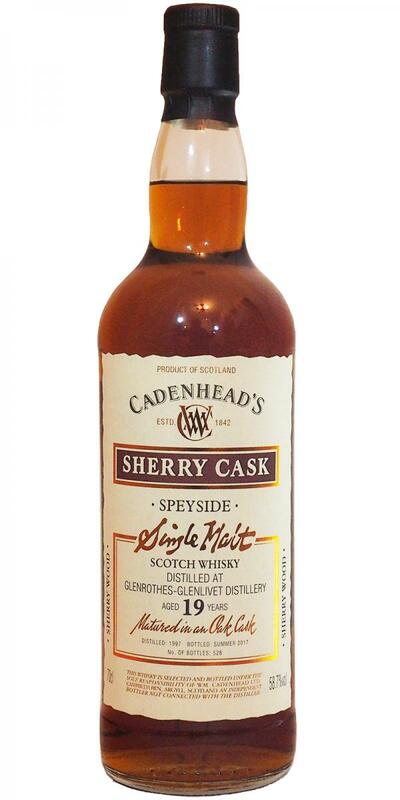 Not too sure about the value for money, but Cadenheads is always a little pricer anyway. That being said, this is tasty malt whisky and lovers of dry sherry will love this even more. Fat and winey, sour and sweet overtones. Oranges, flinty caramel, and mint chocolate. Familiarity to other full-sherried Glenrothes arise quickly – earthy, savory, and umami-esque. With water: honey and beeswax – reminiscent of refill wood. Full impact of dry tannins. Cloying caramel, herbal honey, and associations of marshmallow! With water: Some sugared limes are evanescently emerging, licorice, and tart plums. Medium. The raisins and with that also sweetness arrive late! Somewhat bitter tannins and overt oakiness. Musty, very musty. Dusty library. Leather. The dark fruits quickly turn into dry bitterness. something chilicatch on the palate. Musty. Peppery. Sweet then bitter. altogether beautiful, smooth finish. The throat becomes quite dry, whereas the tongue base feels a lot of sweetness. In the nose and in the mouth a real sherry board, in exactly this order - at first sherry, then oak board. This Fasslastigkeit in the finish says to me less, therefore only 88 instead of 90 points. Note: Notes from a blind tasting. Ui, at first clearly sulfur, with the association burned match. Dark plum jam, Mon Cheri praline (cherry and chocolate), dusty old leather sofa. The alcohol is barely noticeable. Hardly sweet, instead becomes quickly dry and astringent on the tongue. A little pepper, with the continuation of the nose: plum jam, Mon Cheri, sulfur, with strong oak flavor. Pretty long. This is primarily due to the oak notes, which are set intense. Some pepper, sulfur and espresso.